CRM is, in general, a mirage: an illusion based on a nice idea (the right offer to the right customer at the right time), which does not work out in practice. One to One marketing, which sounds wonderful, may not be possible in fact in most product and service situations. We lack the information. The data available about any individual may not be sufficient to predict her behavior, although it may be sufficiently accurate to predict the behavior of the customer segment of which she is a part. Making the right offer to the right customer at the right time may be impossible. People make decisions based on personal factors, which cannot be captured in a database. We can, however, profitably target segments. Companies cannot easily shift from being product centric to being customer centric. It sounds great, but few have actually done it. Most never will. Even if CRM were to work in theory, it does not work in practice, because the increased profits are swamped by the increased costs. We must keep in mind that customer communications, which are triggered by CRM or a database, produce only incremental results. You are already selling something. You hope to sell more and keep customers longer using the database and communications. The incremental sales are usually only slightly more than the sales you would have gotten without the database and the communications. You have to justify your CRM based not on total sales, but on these incremental sales. Many marketers are doing database marketing and calling it CRM. They don’t have a warehouse or million dollar software. They are marketing to segments and making money doing it. That is great! But it is not CRM. Customer Relationship Marketing (CRM) burst on the marketing world in the early 1990s. It was soon adopted by some of America’s largest corporations. After several years of trying, most analysts admit that it does not seem to deliver the benefits that it promised, and may, after all, be a mirage. Let’s see what it was supposed to do, and why it failed. The basic idea was to collect a great deal of information about customers, prospects, products, promotions, and other data, and put them into a giant in-house data warehouse. Many of the warehouses built were very expensive, costing as much as twenty million dollars. Part of the cost was appending of external data about customers and prospects, such as age, income, presence of children, lifestyle, home value, credit worthiness, etc. To access and manipulate the data in the warehouses, very sophisticated software costing at least a million dollars the first year, was installed. In many companies there was a tendency to focus on information technology rather than the business outcome. CRM was introduced by the IT unit often without sufficiently close coordination with marketing, sales, or customer service. The results were expensive systems that did not deliver either successful campaigns or improved profits. The National Retail Federation annual CRM Conference survey of North American retail companies, found that 69 percent of the respondents said they had gained little or no benefit from their CRM investment. Why was this so? Build and maintain a relationship with prospects and customers based on knowing lots of relevant information about them, and using the information to guide customer communications and contacts. One to One marketing is an achievable goal given the right information and software. Stated another way, customer and prospect purchasing behavior can be predicted accurately based on information that you can collect about them. Customer and prospect behavior is heavily influenced by timely and relevant offers. Companies can shift rapidly from being product focused (employee bonus based on the level of sale of particular products) to being customer focused (employee bonus based on the level of sales to particular customer segments, regardless of what products they buy). Introduction of CRM has a positive return on investment by increasing sales and profits by more than its cost. Assumption 1. Why people buy things. Let’s see why none of these assumptions proved to be correct. In the first place, why do customers and prospects decide to buy anything? You can come up with lots of answers, but the key answer is that they decide that owning the product or service at a particular time will make them happier than not owning them. What happiness consists of is defined by the person who is trying to possess it, and varies from person to person, and from time to time. I like Big Macs, but not all the time. Sometimes I like fish, sometimes chicken, and quite often I like home cooked vegetables. There is no way that you can accurately predict what I want to eat next, unless you know what I ate last, how hungry I am, where I am at the time, whom I am with, how much money and time I have available right now for eating. There is no way that any data warehouse could ever collect such timely and relevant information, or that someone besides the customer himself could accurately weigh the importance of each piece of information. Besides my eating habits, the same principle applies to predicting my interest in taking a trip, buying clothing, buying a car or an appliance, or taking a college course. You can collect some relevant information, but you cannot collect enough to make accurate predictions concerning Arthur Hughes today. What you can do with some accuracy, is to say that people in Arthur Hughes age and income group with a similar purchasing habits, are more likely to buy a certain type of clothing or insurance policy than the average person, picked out at random. But of course, that is not CRM, or one to one marketing. That is regular database marketing where you are targeting segments. You don’t need a data warehouse for that. You need only a database (that can be built for a fraction of the cost of a warehouse), which permits dividing the customer and prospect base into purchasing segments. [SIDEBAR] What is the difference between Database Marketing and CRM? They are both based on databases of prospects and customers, which are used to guide marketing and sales strategy. CRM requires a large data warehouse with costly software, aimed at determining and influencing the behavior of individuals through one to one marketing. Database Marketing is based on a data mart, which costs about 10% of that required for a CRM warehouse. Database marketing is usually aimed at identifying customer segments and marketing to them, plus building one-to-one relationships with existing customers through loyalty building communications. To see the difference, think of 100,000 customers on which you have data. With database marketing it might be possible to predict with 90% certainty that 75% of a certain segment of them will buy product X within the next month. But you cannot be 90% certain that Arthur Hughes (a member of the segment) will buy the product next month or ever. The first conclusion comes from segment analysis using database marketing. The second conclusion would come from CRM if it could be made to work. Unfortunately, it cannot. We should note here that there has been a corruption in terminology. Many companies are practicing database marketing, and calling it CRM because it sounds more modern and up to date. They don’t have a data warehouse. They don’t have million-dollar software. They don’t really even attempt one-to-one marketing. They have just built a modest data mart, are creating marketing segments and marketing to them. They call it CRM, but it is just plain old database marketing, which works wonderfully in the right situation. The second assumption is wrong for a similar reason. Do you eat because you are hungry, or because you received a timely communication telling you that a particular restaurant was having a special on lobster dinners? Of course, if you are hungry, enjoy lobster, and have the time and money to go to that restaurant right now, the offer would be a delightful blessing. But the warehouse cannot contain that information. Mass marketing on TV showing people eating delicious lobster dinners at a low price can work wonderfully. The image sticks in people’s minds and will be recalled the next time they are hungry. You don’t need a warehouse to design and place such ads. Mass marketing works very well and is a lot cheaper in terms of sales per dollar spent. Of course there are situations in which a timely and relevant offer can make the difference in a sale. Banks know a lot about people’s demographics and behavior. They can predict the probability of a particular customer buying a particular product and the lifetime value that the customer would produce for the bank if they were to offer the product and if she were to accept the offer. This situation applies to automobile companies who have customers on a three-year lease, and to scores of other situations. But if you will look at most of these situations, good old database marketing will work just fine. We can pick out all the people who have lived in their homes for five years or more without a home equity loan, and send them an offer. It works. We are marketing to segments. We don’t need a warehouse, or one to one marketing to be successful. The third assumption, that companies can rapidly move from being product focused to being customer focused is the weakest of all. After working with dozens of large American corporations, I can report that it is almost impossible for most companies to become customer focused. Why not? Because of the way business is developed. You create a new camera, new computer, new automobile, or a new hotel. The company that develops the product wants to realize a return on their investment. They put a product manager in charge of the marketing of it, and tell her to get busy. She does everything she can think of: mass marketing, point of purchase displays, retailer subsidies, direct marketing. Of course, if you have a list of prospects in your warehouse, she may try a promotion to that list to see if it works. But her goal is to sell hotel space in this new hotel, and only secondarily to increase overall company customer lifetime value. To understand the return on investment of CRM, let’s do a little math. We have to start with some basic principles. Customers do respond to communications, offers, and promotions. For the communications to work the seller has to have some sort of established business. He has a product or service to sell, and a working distribution channel. For CRM to be used, he has to have a revenue stream (otherwise, where would he get the money to build his warehouse?). The reason for using CRM is to make incremental increases in the current level of sales beyond what is being made now with mass marketing, retail stores, catalogs and database marketing. Somehow, the marketer assumes, if he just knew more about the decision making process in the customer’s mind, he could increase the sales level (of customers and prospects) by as much as 5% or 10%. Let’s say that he is selling some product or service for $150. It could be rental cars, small appliances or carpets. He contacts 20 million customers per year, with sales of $900 million. His current marketing methods involve mass marketing, and direct marketing to customer segments, including a loyalty program. We will assume that of the $150, his net profits per sale are 10%, after deducting all costs including marketing. [SIDEBAR] What is the difference between Database Marketing and CRM? They are both based on databases of prospects and customers, which are used to guide marketing and sales strategy. CRM requires a large data warehouse with costly software, aimed at determining and influencing the behavior of individuals through one to one marketing. Database Marketing is based on a data mart, which costs about 10% of that required for a CRM warehouse. Database marketing is usually aimed at identifyingcustomer segments and marketing to them, plus building one-to-one relationships with existing customers through loyalty building communications. Let’s compare this to the cost of database marketing in the same situation. It costs far less. We are assuming a cost of $1.5 million to build the database. Many databases are built for far less, such as $500,000, and some, of course, cost more. The number $1.5 million is a good number for a large corporate marketing database. To these CRM or Database costs, we must add the cost of communications with customers and prospects. After all, if we are going to make the right offer to the right customer at the right time, we have to communicate the offer to them personally, or what is the warehouse for? Let’s assume that our firm has been collecting emails to keep the cost of communications down. They have emails on half of all their customers. Here is the total CRM and database cost assuming an average of only three communications per customer per year. Note, that using CRM or database marketing properly, some likely customers will possibly get more than four communications a year, and some will get only one. Using CRM or Database Marketing we have managed to increase the average sale per customer by 10% to $165.00. We may have done this by getting some customers to place larger orders, by getting some to place more orders, or by reducing the attrition rate, or a combination of these and other methods. Sales have increased by $90 million with increased gross profits of $9 million. Unfortunately, when we factor in the cost of CRM, net profits have gone down by $580,000. That is what virtually all companies installing CRM have discovered. Note that these figures assume that CRM is working – that it is increasing sales by 10%. But, in many cases, for reasons shown earlier, the CRM has no such valuable benefit. In the majority of companies, it does not affect the sales rate at all! Much of the funds spent on CRM are wasted. That is the reason for the Gartner’s group pessimistic conclusion on CRM. 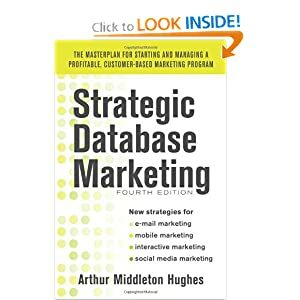 The methods whereby database marketing produces the gains in profit shown above are explained in the remaining chapters and case studies throughout this book. A further discussion of the benefits of a data warehouse is given in Chapter 11, Customer Management. These numbers seem too good to be true. In fact, they are too good to be true. Let’s see what the real numbers actually could be. Let’s take one industry from the list, as representative of the problem: Life Insurance. We will take a typical term life insurance policy of $500,000 for a 45-year-old non-smoker that costs $1,000 per year. For such policies, the first year retention rates are very low. Subsequent rates are much higher. Let’s take a look at the first five years Net Present Value for such policyholders. In this formula, i is the market rate of interest, figured at 6%, and rf is the risk factor computed at 1.2 in the first year, and 1.1 in subsequent years. The risk factor is a number which represents the risk that you won’t generate the sales and profits at all. A perfectly safe business has a risk factor of 1. The risk can come about because customers don’t pay, because of heavy competition, because of product obsolescence, etc. Years to wait is the time that the insurance company has to wait for the profits to materialize. The first year, we are assuming that the waiting time is zero, because we are asking the policyholders to pay in advance. The chart could be made more complicated by adding administrative costs, medical examinations, etc. Leaving these out, we have a relatively clear picture of the marginal profits that a life insurance company can expect to realize over five years from 100,000 policyholders. Fifteen percent is a good solid number, but it is not 90%. Unfortunately, the rate is probably much less than 15%, because we have not figured in the costs of getting the 5% increase in retention. Here is where CRM really has trouble. Nowhere in Reichheld’s book does he suggest building a huge data warehouse and purchasing CRM software to go with it. To do this in the charts above, we would have had to factor in the cost of the CRM needed to produce the 5% increase in the retention rate. The 15% growth in Net Present Customer Value might even disappear and become negative if we were to do so. So, unfortunately, CRM proponents have been using numbers from Reichheld’s book to justify their programs without any solid justification in the book whatsoever. It really should not be so complicated. The goal of CRM is to select the right prospects and to get customers to be more loyal and buy more. Software is of only marginal help in doing this. The goals can only be achieved by coming up with products, services, tactics, strategies and communications that the customers will like and respond to. The CRM warehouse and software do none of these things. The goal can be realized, however, in many other ways, which are outlined in this book.